Posted August 4, 2016 by Dr. Glenn Norton & filed under General Dental Articles. There’s a new trend sweeping the nation that some claim to be a healthier alternative to traditional cigarettes. Electronic cigarettes, also known as E-cigarettes, are purported to be less dangerous and perhaps a successful smoking cessation aid. But at my Evansville dental office, we wanted to know about their effect on oral health. Here’s what we found. Before we dive into any potential oral or overall health issues associated with smoking electronic cigarettes, it’s important to identify what exactly is in these popular devices. Perhaps what makes them so attractive and believed to be better for you is that the juice (often call e-juice) has all the nicotine of regular cigarettes, but less or none of the harmful ingredients. The liquid comes in a variety of flavors and allows smokers get their nicotine fix without smoking an actual cigarette. So, Are They Bad for You? Ever since the increase in use of e-cigarettes began, scientists and health professionals have been working hard to figure out whether they’re actually less harmful than lighting up. Research is still pretty limited on the effects of e-cigarettes, but early studies allude to some possible concerns, and also some potential positives. 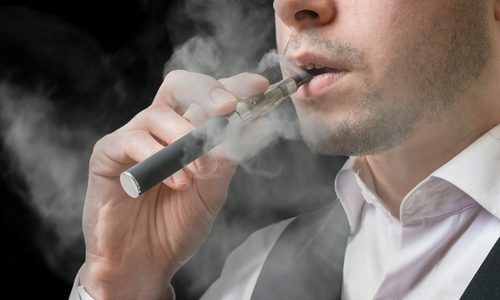 Some of the main concerns revolving around e-cigarette use are pneumonia, rapid heart rate, congestive heart failure, seizure, airway resistance, and potential for gum damage. However, there is a growing amount of research suggesting that e-cigarettes may help people quit smoking. In one study, using e-cigarettes with nicotine helped current smokers reduce the amount of cigarettes they smoked by about half. In short, more research is needed to determine if the benefits of smoking e-cigarettes outweigh the risks. As science works on catching up with the trend to identify the risks of smoking electronic cigarettes, there are some things you can do to limit the effects of smoking anything. Try quitting on your own without the use of nicotine replacements. Keep up with visits to your Evansville dentist every six months to catch any potential oral health problems, like oral cancer, early. Look for organizations that can help. The American Lung Association has some great advice and is a good place to start. Accepting patients from Evansville, Newburgh, Tell City and beyond.